It’s hard to believe, but the summer days are wasting away and fall is swiftly approaching. You know what that means: It’s time to start thinking about your beauty looks for autumn! With sweater weather just around the corner, it’s about time to shed some light on the perfect hairstyle for when the leaves change colors, the high ponytail. 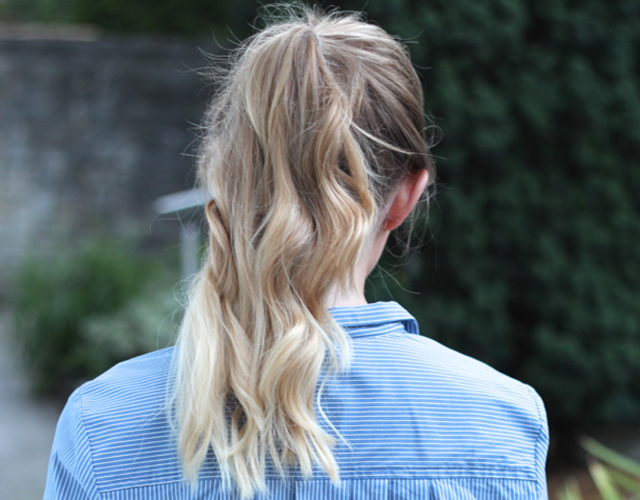 Below, we teach you how to do a high ponytail, complete with volume and staying power. Step 1: Give your hair some texture. If your hair is freshly washed and a little too smooth, add some hairspray or dry shampoo to your hair for some texture. This will allow your ponytail to stay in place all day long. Step 2: Next, pull your hair up towards the crown of your head. Make sure you’re pulling your hair up, not back and don’t be afraid to go higher than you would normally! Step 3: Holding the ponytail in place with one hand, brush out any bumps with the other hand to ensure a smooth, sleek ponytail. Step 4: Once you have found the perfect ponytail placement (center of your head, visible from the front), it’s time to take your hair elastic and secure the pony into place. Step 5: To keep your ponytail looking chic and not like you just came from the gym, take a 1-inch section of hair from the underside of your ponytail and wrap it around the hair elastic. Secure the hair with a bobby pin to hide the elastic, pushing the bobby pin in on the underside of the hair elastic so everything is covered up. Step 6: For some added volume and texture, tease the ponytail with a fine-tooth comb, gently combing hair upwards and towards the front. Step 7: Spray a toothbrush with hairspray and brush down any flyaways. This way, you tame your hair without making it completely flat.